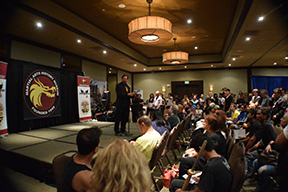 Burbank, CA – Several thousand spectators and martial arts fans filled the 12th Annual Dragonfest convention in Los Angeles. Presented by Burbank's Martial Arts History Museum, visitors enjoyed cultural performances, stuntfighting, Asian music, Chinese Lion Dancing, Hawaiian artistry and more at the martial arts community's biggest martial arts convention. Dragonfest, which is noted as a fund-raising event for the museum, relocated from its smaller venue at the Holiday Inn in Burbank this year, to a much larger facility at the Airtel Conference Center in Van Nuys. This was a wise decision for the museum as record crowds of over 3,000 jammed the Conference Center. Dragonfest was filled with a huge number of martial arts icons, pioneers, champions, founders and history-makers. Among them were a number of recognized film stars including Casper Van Dien of Starship Troopers, Phil Morris of Seinfeld, Sasha Mitchell of Dallas and the cast of The Karate Kid, Big Trouble in Little China, The Martial Arts Kids, Sci Fighter, The Chemist and more. Martial arts films stars Cynthia Rothrock (Queen of the Martial Arts) and Don “the dragon” Wilson were also on had to sign autographs. Cosplay was also represented including Nick Palma, one of the original Ninja Turtles and Jennifer Wenger as Wonder Woman. The kids also had a great time with face painting and visting a number of toy vendors and anime artists. Christophe Vacher, two-time Emmy Award Winner was among a number of celebrated artist which included Jerome Lu, Eleazar Del Rosario, the Kano Kid, Ed Parker and Carol Blaylock. “Artistry plays such a huge role in the martial arts and we were thrilled ot have some of the greatest artist of our generation on-hand. Books and many publications were also showing their wares including Heritage Source, Myriad Publications and more,” adds Matsuda. The Dragonfest convention packed out the entire hotel and made use of all their restaurants and facilities. “We are always glad to have then event close to a hotel so that our visiting guests and enjoy the event, plus, we love supporting the hotel by bringing them more customers. The last two years, we sold out every room at the Holiday Inn, we were happy to to that at the Airtel Hotel,” says Matsuda. For more information about Dragonfest or the Martial Arts History Museum, visit their website at Mamuseum.com or call (818) 478-1722. The museum is a Non-Profit 501(c)(3) organization and is completely supported by donations and memberships.